(Deal ends Feb 16th) Stop by Target this week, where they have select Household items included in a buy three get a FREE $10 Target Gift Card promotion. When you buy one Tide Liquid Laundry Detergent (64 loads), one Tide Pods (42 ct) and one Bounce Dryer Sheets (240 ct), you’ll be able to use 10% Off Tide Pods or Gain Flings Cartwheel Offer! 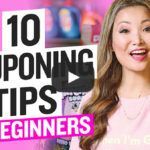 In addition to this, you can use these three coupons, all with a limit of one per transaction: one $3 off one Tide Liquid Laundry Detergent, one $3 off one Tide Pods and one $1 off one Bounce or Downy Product coupon! After the $10 Target Gift Card, your final price will be JUST $5.11 each or $15.33 for all three!